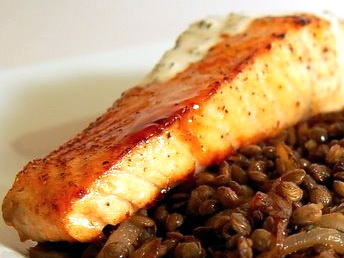 You can substitute steelhead trout, arctic char, or any pink fish for the salmon. Preheat the broiler, and wrap a broiler pan with aluminum foil. Cook salmon for 6 minutes per inch of thickness for medium doneness (8 minutes for well-done). Start it under the broiler (4 inches away from the flame) and check it every couple of minutes. As soon as the top browns, turn down the oven to 400 degrees, and move the salmon to the middle of the oven to finish cooking. To test for doneness, separate the flakes in the thickest part of the fish with a fork and peek inside. Salmon is cooked to medium when you can separate the flakes at the surface, but get a good bit of resistance in the center of the fillet; the flesh will look very translucent. After salmon rests for 5 minutes it will flake, but still be a little translucent in the center. If you prefer your salmon well done, cook it until only a trace of translucency remains in the center. After a 5-minute rest, it will be completely opaque. Thin out the sauce with 1-2 Tbsp. of water until it’s barely thicker than heavy cream. Season to taste with salt and pepper. Place salmon on serving plates (if the salmon skin sticks to aluminum foil, just leave it there), pour the sauce on top, and serve. Wondering how long your fish stays fresh? Be sure to read Helen Rennie's column on buying and preparing fish.